Elizabeth Daniels Squire came from a noted family of letters: her grandfather, Josephus Daniels, founded and edited the Raleigh News and Observer; her father Jonathan, also an editor, authored biographies and regional studies; her sister Lucy is a novelist. So it is not surprising that Elizabeth Squire began as a journalist and married a journalist, before building her own illustrious literary niche and an enthusiastic national following for her mystery novels. A Vassar graduate, Squire served as a columnist in Beirut and a reporter in Connecticut. When she and her husband, C.B. 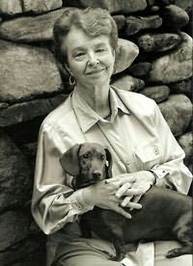 Squire, a New York Times correspondent, moved to a farm in Weaverville, North Carolina, she began writing mysteries, drawing for her first novel, Kill the Messenger, on her expertise in journalism. For her second, Who Killed What’s-Her-Name?, Squire invented a sleuth, Peaches Dann, much like herself: a middle-aged, significantly absent-minded woman who was also warm, smart, and witty. Six more Peaches Dann novels, all enlivened by humor and colorful details, were published before her creator’s untimely death in 2001. Known in her home state and throughout the nation as a generous, energetic friend, Elizabeth Daniels Squire made her mark as writer, colleague, wife, mother, and citizen. She left us too soon, but her legacy will endure.